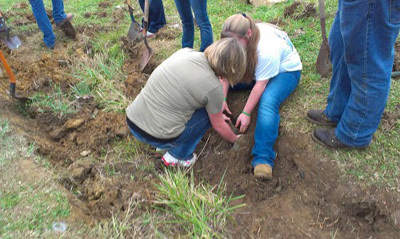 On October 26, 2012, Musselman High School’s WET Club planted 12 native shade trees through WV Project CommuniTree. This was part of a larger event on the same date to plant 12 trees, install two bioswales, reseed a large area of exposed ground, install and plant a raised bed, and assemble three hydroponic units. Each group had its own student leader and adult volunteer. There were 53 student volunteers in all and six adults: Herb Peddicord, Neil Gilles, Frank Rogers, David Koritko, Deb Stevens, and Jane Barvir. 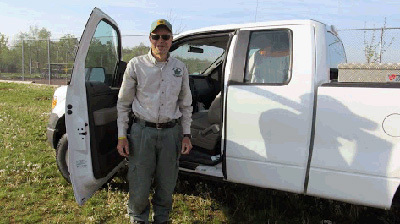 Herb Peddicord lead the tree team. Jane supervised the seeding team; Frank and Neil supervised the bioswale teams. Deb Stevens circulated among the groups. The twelve trees were planted near the band field, near the entrance to the ban d room. One tree replaced a tree along the sidewalk on the south side of the School adjacent to the student parking lot. The weather was clear and unseasonably warm. Hurricane Sandy blew through the area on the following Monday night resulting in a huge volume of rain. Some of the hay covering the area in the back reseeded was disturbed and several trees had to be straightened. These trees are part of the overall maintenance program; students and the maintenance staff have committed to annual mulching, removal of the stakes after one year, trimming, and watering as necessary.